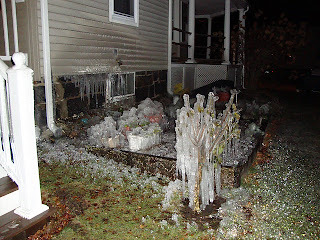 this is what happens when you don't turn off the water hose before winter. i thought it was pretty until i realized it doubled our water bill for the quarter! Over the years my website has been dedicated to a few different things - first it was a place to experiment with html and post pictures from my digital camera. That sounds like nothing exciting now, but back in the mid nineties I was the only one I knew that had a digital camera or my own domain on the internet. Once I got the hang of how to post stuff I became the official paparazzi for all of my friends and everything we did got posted to my website. Now that everyone has a digital camera and facebook, I have been relieved of my paparazzi status and my website is now devoted to my blog. As of 2010 the only posts are about my travels around the world, but now that I spend most of my time in corporate america I'll have to think of something else to add here. The only other web content I have online (other than this site) are photos posted on picasa. There's millions of them! Some are interesting, some are not. Some still aren't online yet and are packed in a box in the garage that I can't find. In 1995 I spent a semester in Spain and before I went home I spent winter break with my sister, Caroline, taking the train around Europe. Before meeting her in Germany I went to Portugal, Italy, Hungary and Austria. I had a great time in Italy with my friend, Kathy. We were supposed to take the train to France but due to a train strike there, our only option was to fly out of the country. A one way ticket to Rome for $100 was the cheapest option, so off we went. It was a fabulous choice. I left Kathy in Italy and made my way to Germany by myself. Along the way I met a Swiss au-pair who taught me how to say room in German (zimmer) and I ended up going to Hungary and Austria with her. We sang Christmas carols for our hours on end on those train rides. Once I met up with Caroline we stayed in Munich at Claudia’s house, my friend from high school. After Christmas we made full use of our Eurorail pass and went to The Netherlands for New Year’s, the former East Germany to visit someone Caroline met on a plane once, and the Czech Republic where we stayed with a babushka. From there we took the train to France and along the way had a layover in Zurich where I bumped into a girl who lived in my dorm at UMASS. We hobnobbed in Luxembourg and said hello to the Mannekin Piss in Belgium. It was love at first sip when we tried our first Hoegaarten! January was an absolutely freezing time of year to take this trip and most of the time we wore all the clothes in our backpacks. On the plus side, the hostels and trains were virtually empty so we could easily make plans on a whim. It was such a long time ago that it was before the Euro was in place. I have a kept a coin from every country I have ever been to and now many of them are out of circulation. I suppose you could say they are worthless, but are souvenirs I never planned to spend. Over the years I have been to: Egypt, Australia, Brunei, Cambodia, China, French Polynesia, India, Indonesia, Japan, Laos, Malaysia, Mongolia, Myanmar, New Zealand, Philippines, Singapore, Taiwan, Thailand, Vietnam, Austria, Belgium, Czech Republic, Denmark, Estonia, Finland, France, Germany, Greece, Hungary, Iceland, Ireland, Italy, Latvia, Lithuania, Luxembourg, Norway, Poland, Portugal, Russia, Slovakia, Spain, Sweden, The Netherlands, Turkey, United Kingdom, Bahamas, Mexico, Canada, Guatemala, Honduras, Argentina, Brazil, Ecuador, and of course the United States!